Background: RF Explorer is a handheld spectrum analyzer which can be used on all popular ISM bands, to keep this thread short I won't extend much on current capabilities, you can get more info at http://www.rf-explorer.com. Let me know if you need any more details. Now the question: I am going to extend the current firmware with packet sniffer functionality, so RF Explorer can decode and show on screen any wireless packet being OOK or FSK, the two most popular modulation schemes. More interestingly, RF Explorer will be able to send and receive OOK / FSK packets so it can act as a packet monitor but also as a remote control for a configurable frequency and packet format. I am looking for ideas, suggestions and specific needs to fulfill in this area. It will be implemented in a way that can work with any RF transceiver in the other end, assuming it works with OOK or FSK. Arduino code examples will be used in all cases. The Open Source Windows PC Client will display packet in a similar way as Texas Instrument Packet Sniffer does for SimpliciTI (see screenshot below), the only difference is RF Explorer is not limited to a specific vendor protocol. Any suggestions on specific needs beyond that you may suggest? This major feature for RF Explorer Spectrum Analyzers is now available as public Beta release. Advanced zoom, contextual menus, text, configuration settings for sample rate and frequency. 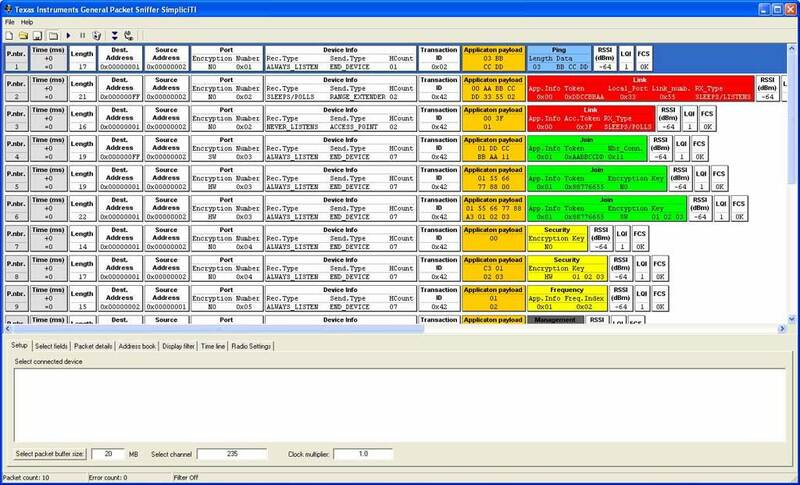 There are so many features included, the only way to elaborate them is through an accompanying guide included in the software package. Download available in the BETA area of the download page. You can detect RF transmission and decode data either manually or automatically. The RF transmission would look like a train of pulses at first sight, but it can include a large number of unusable noisy data, as well as duplicated data packets transmitted by the gadget. Thanks to RF Explorer Sniffer tool advanced features, you can easily remove unwanted noise and detect envelope digital modulated signal, so it can be interpreted according to available documentation or reverse engineering. Using this extremely advanced feature, checking any RF transmission is now a trivial task. Below is a fully decoded RF remote control data packet including address and data values when pressing button  of that particular remote control. A good example of use for this would be to adjust your remote control receiver to the right address to react to that remote control. And this is an example of fully decoded Oregon Scientific Weather Station sensor transmitting 7.9C temperature and 55% humidity. This useful tool enables RF Explorer models such as 433M (by a mere $99) assist you on debugging RF projects, detect wanted and unwanted transmissions and interpret any gadget at hand. As opposed to other tools available, you do not need to disassemble or connect cables to the RF gadget in order to detect what is being transmitted: your RF Explorer connected to a Windows PC is all you need for the antenna capture and sniff around! By using a simple yet effective Add-in model, RF Explorer for Windows can be easily extended with your own Decoders. You can develop decoders in any language, samples are provided in Python and C#, but others like Perl, VB, C/C++, Java and pretty much any environment you are familiar with can do the work just fine. The only requirement is to produce a command line tool, following certain convention for data communication between the Add-in and the RF Explorer for Windows tool.